MPG converter lets you recalculate fuel economy units between US and Imperial miles per gallon and liters per 100 kilometers. Keep in mind that these units are inversely proportional (they "go" in the opposite direction). An efficient car consumes a low amount of gasoline per 100 kilometers, but can travel many miles on a gallon. Our gas calculator is closely related to these issues, it lets you calculate the total cost of a car trip based on the mileage, distance and gas price. Fuel economy is the relationship between the distance vehicle travels and the amount of fuel it consumes. When calculating, it's important to distinguish between US and imperial gallon as they represent different values. Another important difference is between measurement systems - when using miles (either imperial or US) per gallon, higher value represents better efficiency. On the other hand those using liters per 100 km usually hope for a lower score as it results in smaller gas bills. . If you want to go deeper into the topic, check out our speed calculator which deals with the trinity of time, distance and speed. The acceleration calculator on the other hand says how the velocity changes over time or how a given force impacts an object of a given mass. 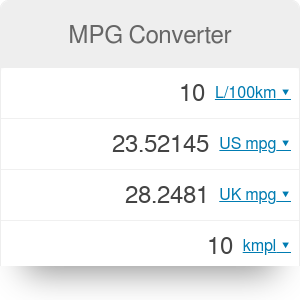 MPG Converter can be embedded on your website to enrich the content you wrote and make it easier for your visitors to understand your message.